Place the breadcrumbs, thyme, fennel seeds, chilli and lemon rind in a medium bowl and mix to combine. Transfer the breadcrumbs to a shallow tray. Using a meat mallet, pound the chicken to 5mm thickness. Place the flour, salt and pepper in a second shallow tray and mix to combine. Place the eggs and milk in a small bowl and whisk to combine. Dust the chicken in the flour mixture, dip in the egg mixture and press into the breadcrumb mixture to coat. Heat 1cm of oil in a large frying pan over medium heat. Cook the chicken, in batches, for 4–5 minutes each side or until golden and cooked through. Drain on paper towel. To make the slaw, place the mayonnaise, lemon juice and pepper in a small bowl and mix to combine. Place the fennel, cabbage and half of the mayonnaise mixture in a bowl and toss to combine. Slice the schnitzels and divide between plates. 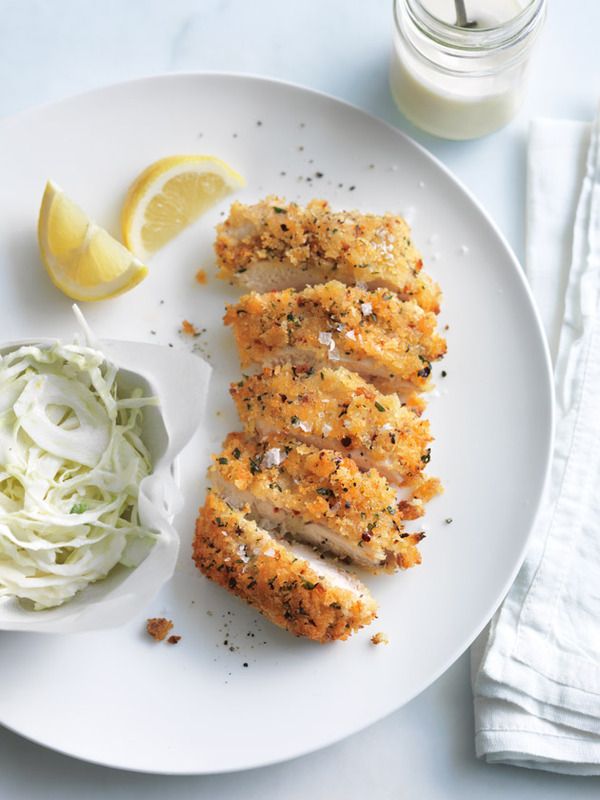 Serve with the slaw, remaining mayonnaise mixture and lemon wedges.